Ben-Hur, lame police tactics, and gay marriage: The week’s most interesting Slate stories. 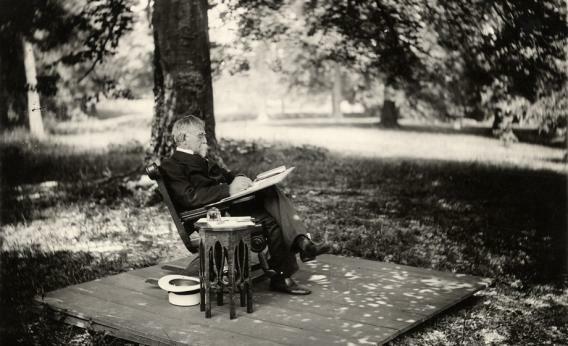 Lew Wallace composes under the Ben-Hur beech. “The Passion of Lew Wallace: The incredible story of how a disgraced Civil War general became one of the best-selling novelists in American history,” by John Swansburg. Swansburg recounts Wallace’s triumphs and failures, from his ignominious role at the 1862 Battle of Shiloh to his association with legendary gunslinger Billy the Kid. And he describes how the iconic Ben-Hur, a novel which helped reunite America after the trauma of the Civil War, came to be written. “Boston Punk Zombies Are Watching You! : The Boston police go undercover on the Internet to stop the city’s most dreaded scourge: DIY indie-rock shows,” by Luke O’Neil. The Boston Police Department has been going undercover on social media sites to get information on underground indie rock shows. The problem is, O’Neil writes, that a hipster can sniff out a fake from a mile away. His piece raises questions about the allocation of police resources and the usefulness of social media as a crime-fighting tool. “The New Stimulus Package: Overachievers are popping Adderall to get ahead. Is that a good idea?” by Will Oremus. Will Oremus asks some hard-hitting questions about Adderall usage. Is the use of brain drugs by healthy professionals cheating, like the use of performance-enhancing drugs by athletes? Does Adderall have a different effect on the ADHD-brain and the ADHD-free brain? And if not, where is the harm? “Blue Sky Thinking: The entirely serious plan to collect solar energy by spaceship and beam it back to Earth with lasers,” by Jeffrey Ball. Rather than cost or scale, the biggest obstacle to space solar power may simply be the “giggle factor.” Still, with rivals like China becoming interested, the United States has increased motivation to set this project in motion. “Ditching DOMA: Judging by Wednesday’s Supreme Court hearing, the Defense of Marriage Act can’t be defended,” by Emily Bazelon. Bazelon explores the genius of United States v. Windsor’s court challenge. The case aligns state sovereignty with gay couples’ sovereignty over their lives and is proving the indefensibility of the Defense of Marriage Act. Also, John Culhane investigates why and under what circumstances the Supreme Court might dismiss a Prop 8. “Rand vs. Rubio: Whether either senator will become a presidential contender depends on how much the Republican Party is willing to change,” by John Dickerson. Rand and Rubio are the alliterative duo taking the GOP by storm. Both are young and ambitious Republicans in a party looking for its next leader. As their party continues to go through a molting period, either man’s success will hinge upon how much the Republican Party is willing to change. “Is Minimalism Really Sustainable? : It’s easy to live with very few things if you can buy whatever you want,” by Katy Waldman. Waldman responds to a recent essay in the New York Times Sunday Review, in which the founder of Treehugger.com describes his transformation from ardent consumer to modern day minimalist. She points out that minimal living can sometimes require a more than minimal cash flow. “Offed the Record: Can a journalist publish off-the-record quotes after a source dies?” by L.V. Anderson. The Russian edition of Forbes magazine published an interview that had been conducted less than 24 hours before exiled Russian billionaire Boris Berezovsky died. Anderson asks if it is ethical for journalists to publish off-the-record comments after a source’s death.